A good—and colorful—instance of all’s well that ends well. On the language side, I’ll add that the French word couleuvre developed from Vulgar Latin (bas latin) *colobra. In Portuguese, which often lost an l between vowels, the Vulgar Latin word evolved to cobra, which English and other languages now recognize as a particular kind of snake. Thanks for that, it is interesting to follow the evolution of words, especially when they are not obvious at first glance. Wow, a big ol’ snake in the house! He’s a beauty, isn’t he? Where I used to live it was common for people to keep rat snakes in their attic to ward off pests. I’d much rather have a snake patrolling the premises than use chemicals. He has never come inside again but we feel he used to when the house was empty. The roof has terracotta tiles and we know he goes under them. They do take small mammals like mice but I think my ultrasonic device I keep in my utility room is more efficient to dissuade them from coming in. and have a very smelly way of defending themselves from the same orrifice. although the smell from the regurgitated fish that the Manx Shearwater chicks vomited on it did go eventually…. and there was a distinct odour of gazole from spraying on the jacket as well…. 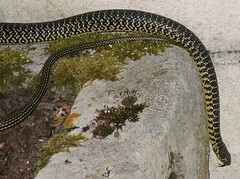 however, because of the grass snake ess-aitch-one-tea… the jacket went!! Have you come across the new dual-language Biotope Guide to the Vertebrates of Britain and Europe? We treated ourselves to it for Christmas… superb! !